What can be more delicious than bacon and garlic on pasta? Try this recipe made with Knorr Chicken Cube, it will put a big smile on your face! 1 Begin by getting your pan nice and hot over medium high heat. Pour 1/2 tablespoon of olive oil and render oil from the bacon. Set aside when cooked. 2 Melt the butter and add the rest of the olive oil. Throw in the garlic next and just sauté until golden in color. 3 Drop in the Knorr Chicken Cube and dissolve. Finally, toss the bacon, basil and noodles in the mix and that’s our dish! 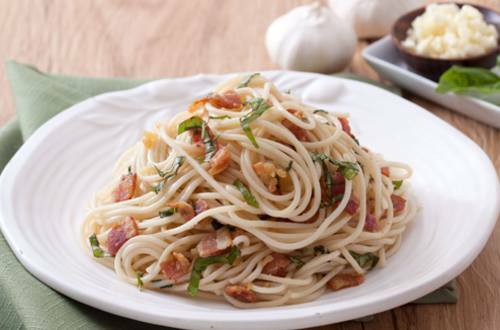 4 This Bacon and Garlic Pasta recipe is meant to be shared with others. Truly, something as delicious as this should not be kept secret.